Welcome to my website. 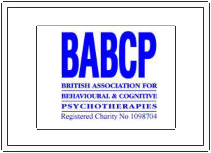 I provide an effective, safe and confidential Cognitive Behavioural Psychotherapy (CBT) and Counselling service from a convenient location in Chester, Cheshire. I have extensive experience working with clients in CBT and Counselling, both in the NHS and private sector and my qualifications and experience enable me to tailor my approach according to client need and requirements. I have more than ten years experience in the NHS, undertaking CBT, and Counselling with clients presenting with a diverse range of difficulties and problems. I am registered as a specialist provider with various Health Insurance Companies, for example BUPA, AXA PPP, Vitality, Nuffield Health and Aviva as well as other private and public sector organisations such as Insurance Companies, and Solicitors and also accept self-referrals and referrals from General Practitioners.